FightVG: Street Fighter x Mortal Kombat? 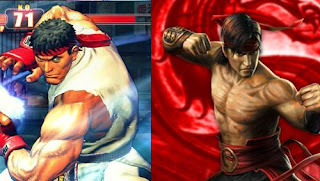 Street Fighter x Mortal Kombat? Hell may have frozen over. For years fans of the Street Fighter and Mortal Kombat series have been clamoring for a crossover. After years of anticipation, they may finally get one. With both Street Fighter IV and Mortal Kombat 9 selling over three million units (sources here and here), a crossover could potentially shatter sales records. It may be the reason why both NetherRealm's Ed Boon and Capcom's Seth Killian reached out to each other via social networking. "Yes, great catching up with you too. Looking forward to our first MKvsSF meeting. 1st order of business: MKvsSF or SFvsMK. ;)"